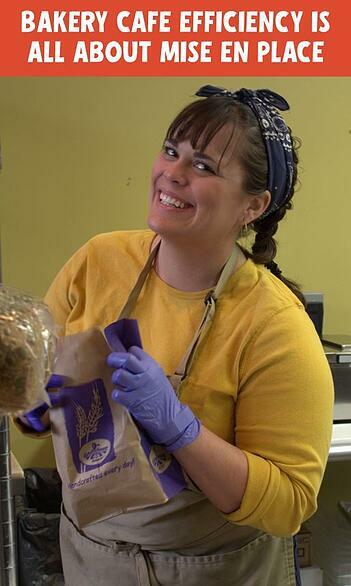 Have you ever wondered about how Great Harvest will set your bakery cafe up for efficiency? 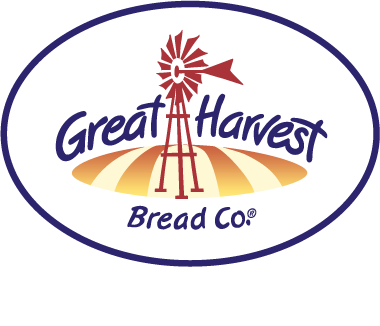 Opening a new Great Harvest bakery cafe is a multi-month undertaking that culminates in a three to four-week grand opening process. During the two to three weeks before opening and the week following the opening, Great Harvest trainers from the franchise office and established franchise owners travel to the new location to help open its doors. The opening training process is comprehensive and starts with Bakery Cafe Setup Week. 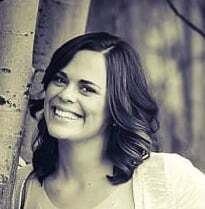 Over the last five and a half years, I’ve had experience with all aspects of store openings. Although it’s tough to pick a “favorite,” I love being the Bakery Cafe Setup Week trainer. The focus of the week is clear in its title – we walk through the bakery cafe and set up the physical areas of the store. 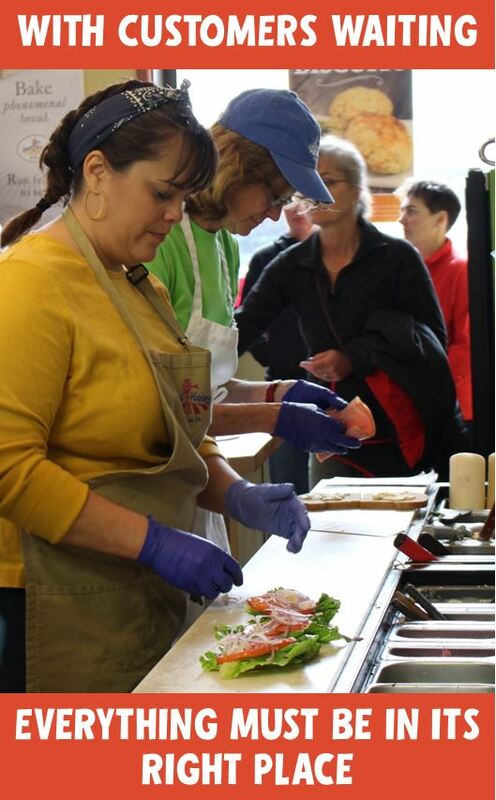 Our objective is twofold: a) ensure the store’s traffic flow is appropriate for the long term per the bakery cafe goals and architectural designs, and b) confirm the next round of trainers have the tools and mise en place necessary to conduct a successful training and grand opening. What is mise en place? The French culinary phrase means, “putting in place” or “everything in its place.” It refers to the setting up of a cook space prior to cooking. In professional kitchens, it refers to the appropriate arrangement of ingredients and tools required to prepare menu items. It’s easy to see why mise en place is key to efficiency for a food business or a serious chef. Mise en place is the essence of Bakery Cafe Setup Week and I wanted to share some tips to help you achieve it – whether it’s in your Great Harvest Bakery Cafe or your home kitchen. This concept is simple enough; it is important to keep like ingredients and tools together based upon where, when and how they are going to be used. At home, you might store all your spices in one place, or all of your utensils in another, grouping like items by type instead of usage. When I set up a bakery cafe, I strive to think in stations (goodies; bread; sandwich/made to order), zones (production; customer service; lobby) and day parts (breakfast; lunch; dinner). I try to keep all spices and ingredients necessary for the sandwich station near the sandwich station. I do the same for other areas of the bakery cafe. For common spices and ingredients that are shared across different stations, I divide them into smaller containers, so each station has its own set of ingredients. That way, for example, the sandwich maker doesn’t need to interrupt the bread baker to borrow minced garlic, disrupting the flow for each of them. In a week, the amount of time cumulatively wasted from such details is great, all while hungry customers are waiting. The same theory applies for tools. Tools should be stored in each station, and if multiple stations need to share the same small tools frequently, then each station should have their own set. While it is impractical to buy multiple pieces of large equipment, if everyone needs to use a whisk, for example, having more than one is a small investment for a significantly more efficient cook space. Zones and day parts also require consideration. Do I want to use the same broom to sweep up flour in the mill room (production zone) that I want to use in the lobby (customer zone)? The answer is no – so ensure that cleaning supplies and other tools are carefully considered and appropriately stored. With day parts, keep in mind different needs for packaging (think, more coffee in the morning – do I have my cups appropriately stored? ), cleaning, customer service and more. As you are designing and setting up a bakery or kitchen, it is essential to consider the number of footsteps required to complete each major task. Although there is give and take, you need to enable your employees to complete their jobs in the most efficient way possible (which translates to happier customers and lower labor percentages for you as an owner!). Look at how many footsteps your baker needs to take from the kneading table to the oven. Consider how many footsteps your sandwich and made-to-order employees need to take from the sandwich station to the walk-in refrigerator. How many footsteps do your customer service representatives need to take to deliver made-to-order items from the line to the customer? You need to ensure that key store components are efficiently placed and the tools needed to complete routine tasks are all readily available in the major stations. One of my favorite things about setting up a new bakery cafe is baking for the first time. If you’re not certain a process or function is going to work, give it a “dress rehearsal.” Sometimes it’s a disaster, but I love that it works out the remaining kinks! Are my ingredients readily available? Are my tools appropriately placed? Am I wasting footsteps to do a job that could easily be saved if I just moved this item to a different place? Walking through the process you’re trying to organize helps you understand if your organizational efforts are on track. We’re all different heights, shapes, and sizes. One of the most common (and dangerous) mistakes I see contractors and bakery cafe owners make when they are constructing a store is hanging shelving too high for everyone to access. The most common scenario I encounter is the 6’3” contractor hanging a shelf at his own height (making it too high for the 5’2” baker to reach without a step stool). From shelving height to walkway width, make sure workspaces are accessible for your entire crew – not just the person putting things in their place. Be Cognizant of Clutter and Customer View Line—Make it Look Nice! Many of our bakery cafes feature an open design where the production area is easily in view of the customer. This transparency is very cool and integral tocustomer engagement. We have nothing to hide – and, in fact, we want the customer to see what we’re doing. However, that means we need to make sure we’re organizing things well and keeping stations immaculately clean. Everybody has a “junk drawer” at home and sometimes these catch-all spaces are equally unavoidable in a bakery cafe. Just remember they need to be clean, organized and out of customer eyesight. If you don’t have a nook for off-season packaging, décor, and the tools you only use one season a year for a specific product, consider storing these off-site or in a decorative container that doesn’t take away from the visual splendor of your store and the bread making process. Try applying these ideas to your own kitchen and see how much time you save. And when you visit a Great Harvest bakery cafe, pay attention to how it’s been set up for efficiency and customer flow. See if you can figure out the logic behind each object's right place.